All the writing for his book was on one flash drive. Bending to the tyranny of fear that harm might come to the computer – a theft, a lightning strike – Bob only wrote on the flash drive, placing it in different spots throughout the house to further protect his work. Eventually, he couldn’t find it. His exhaustive searches dwindled before he struggled toward acceptance. Like the colonists who fought for the right to build a free country for its citizens, one that’s been adapting for 237 years, writers constantly carry on a process of creating and recreating. Revision IS writing, and when we have something, anything, on paper, we have a place to start. However, Bob, with no draft to revise, had a choice to survey scattered notes, comb his memory and reexamine his thoughts to spark a creative revolution. So many things can happen to stymy a writer’s progress. Losing your work is a harsh one, yes, but it is possible to completely rewrite a lost piece from scratch. Make peace with the fact that the writing is gone. Feel the sadness, then replace it with gratitude that you still know the story and have the ability to write it again. Celebrate your right to creative independence as you prepare to represent your story anew. Even if all you can get down are the bones, these basics are a start at structure to hang specifics on. Question what you have to find details to fill in the framework, and continue writing. If you have a draft with notes, yet aren’t a happy camper, pitch your tent somewhere else. Switch gears to another chapter, or work on a completely different story. Let the frustrating one rest, and seek a different view. Maybe a new campsite will have more sun and warmer inspiration. Sometimes you realize a draft isn’t going anywhere. Working within it becomes more of a struggle than simply starting fresh on a clean page. Be grateful the unusable draft did its work by clearing your mind. Go with your gut. Move on, and begin again. Revere your process, and volunteer to re-enlist in your project. A setback doesn’t mean the cause isn’t winnable. Adaptability is a creative act. 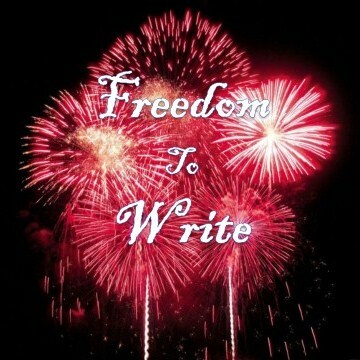 Stand up to your issues, then express your freedom to write. Disclaimer: It’s true; writers write what they know, and, yes, I write from my experiences. However, all characters and situations in my stories are fictitious fusions, creative amalgamations. Any resemblance to real persons, living or dead, or real interactions with me are purely coincidental. ;-)Subtle. Clever. Happy Fourth to you, Darlin’! “Even if all you can get down are the bones, these basics are a start at structure to hang specifics on.” Wonderful advice. Thanks, Sheryl! I look forward to reading your latest. . .soon! Happy Fourth to you, too!